March?? - yes, this year also March, for the first time. But this is a longer story. 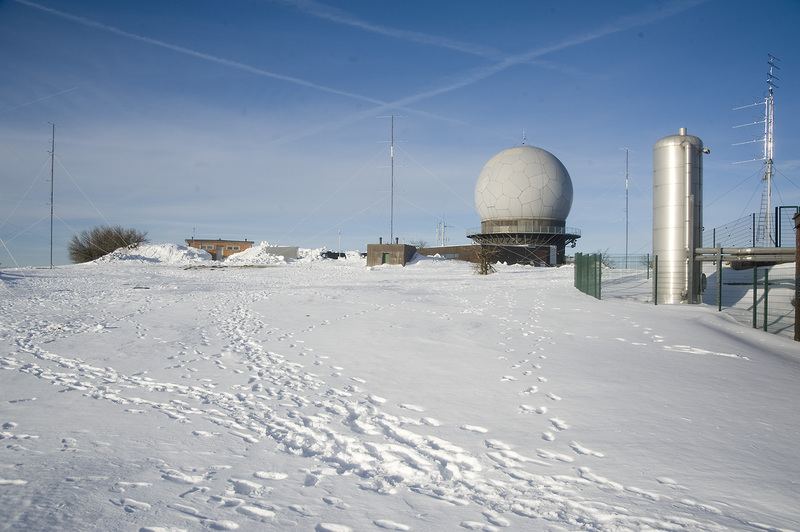 Our QTH on Hohloh JN48EQ is not easily accessible during the winter time. There is sometimes a year with few snow, like 2014, when we could drive up already in March, but until now we never did. This year was different - not excessively much snow, but too much to go up easily. 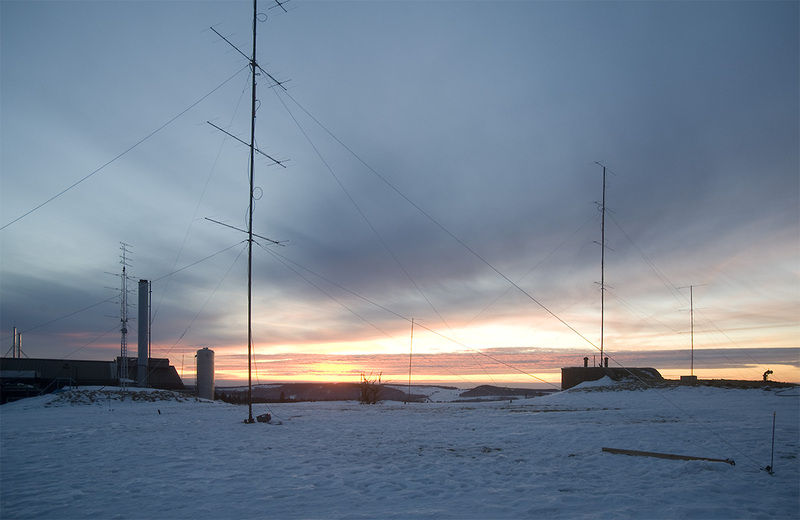 In 2014 we already had some cooperation with DL0BA/DA0FF. 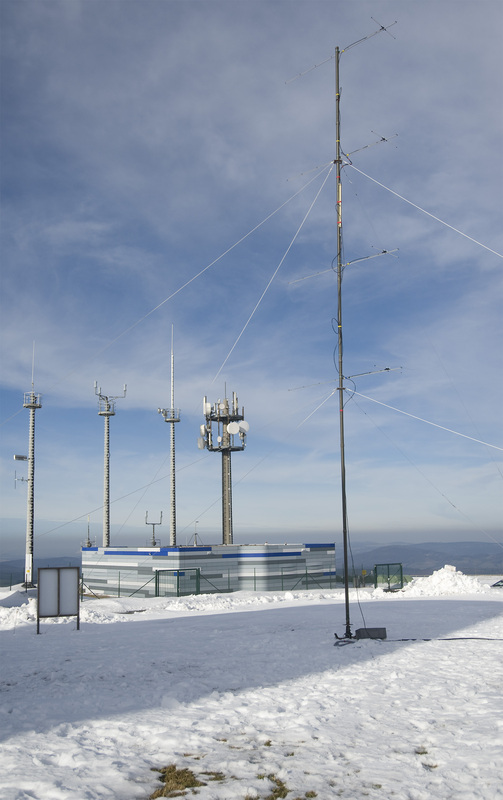 And this team was determined to start the contest year as early as possible, and go up to their QTH "Wasserkuppe" in JO40XL 950 m asl with the big 2 m setup. Though they are located nearly as high as we are their snow situation is slightly better, and the roads up to the QTH are kept clean by a public service. So we agreed to join them with our 70 cm and 23 cm equipment, and have some fun together. 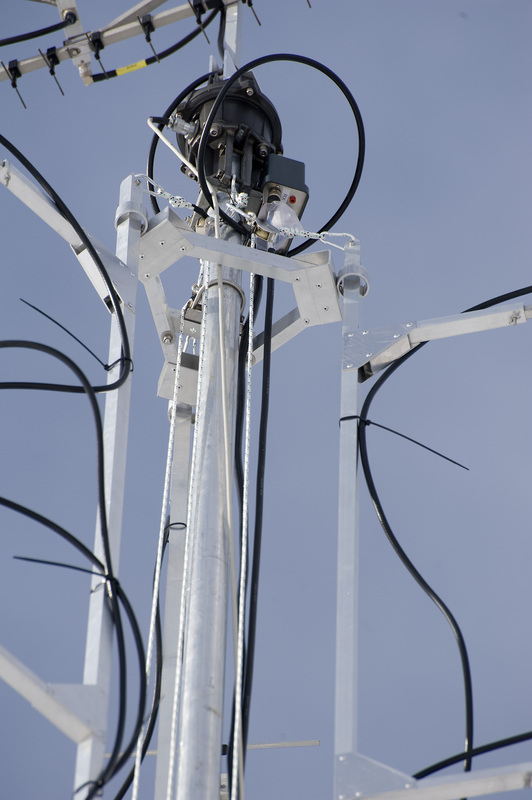 We had to prepare a special antenna setup because everything must be mounted on a relatively small mast. The work began in January, and as usual, was finished only shortly before the date. 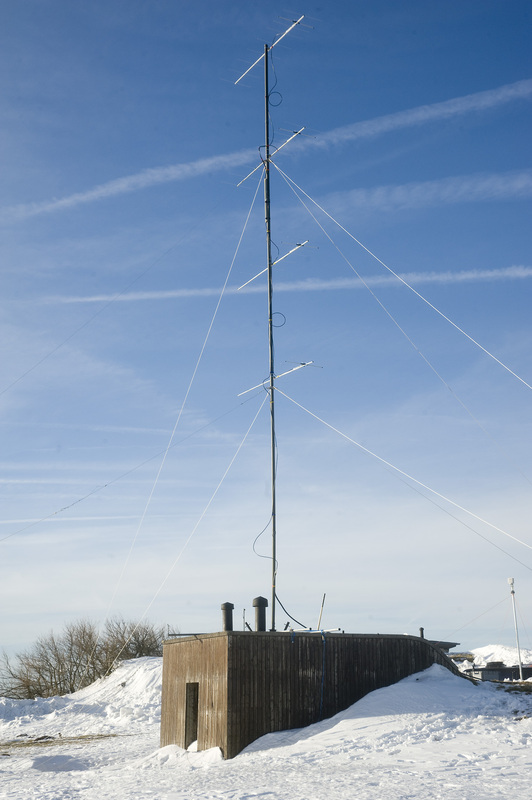 The whole setup could not be tested: we used two aluminium tubes from the DA0FF stock with some new built parts to form a 10 m sliding mast with 4 antenna installation positions. We exchanged some material at the Dorsten GHz meeting so that at least the central element could be tested before that it fits mechanically. We had mixed expectations - much would depend on the weather. 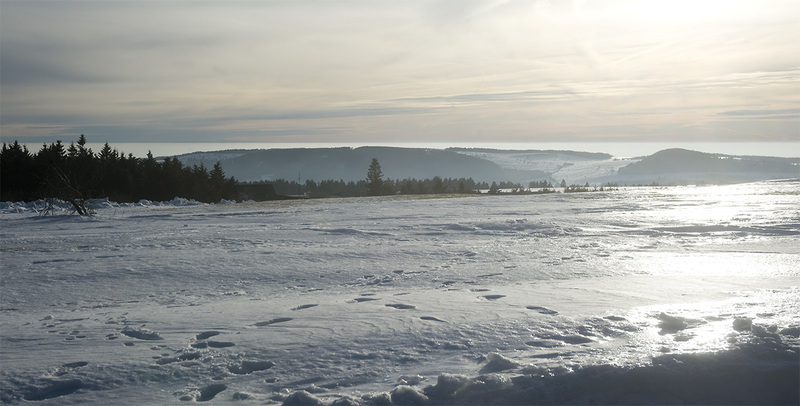 The forecast was very unstable, changing from cold (-16 °C) and dry to snow and to rain and back still a week before, but as you can see on the photos we came out as the lucky ones. Saturday was sunny and a bit windy, but Sunday extremely nice and warm up to 10°C. From our side DF5HC, DF9IC and DL8AAU participated. We started on Friday - DF9IC has about 260 km to drive with the heavy trailer, DL8AAU about 130 km. It was after 4 pm when the last of us (DF9IC) arrived, 2 h behind the schedule, but it was only then that the final 500 m of the road had been cleaned so far that we could bring up the cars. 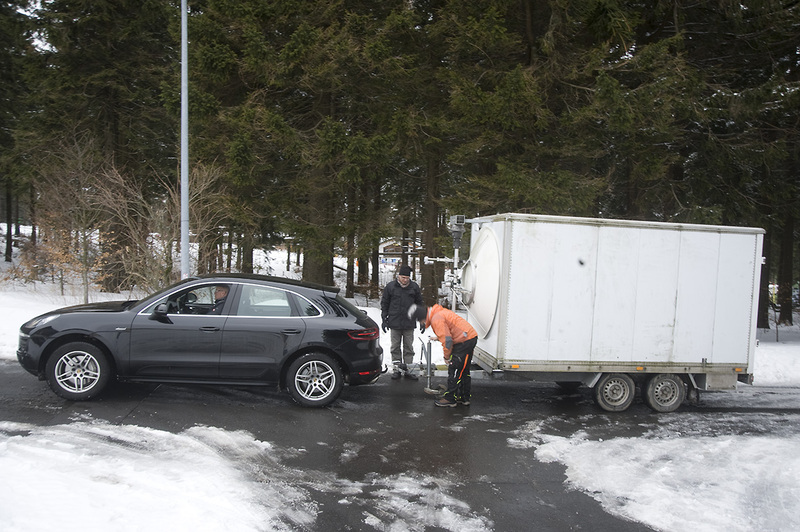 Nevertheless the trailer got a new towing vehicle - Ben's (DL6FBL) Porsche Macan with 4WD. Yes, it really exists, the Porsche with a trailer hitch! We arranged the vehicles, connected the line power, and started to prepare the masts and antennas. But the main work had to be done the next day. Around 8:30 pm, about two hours after sunset, we met close to the barbecue in a gas-heated covered trailer, with beer and wine and lots of good talk. It was after 2 am in the night when we went to sleep in the nearby hotel. After breakfast at 8 am we went back to work. 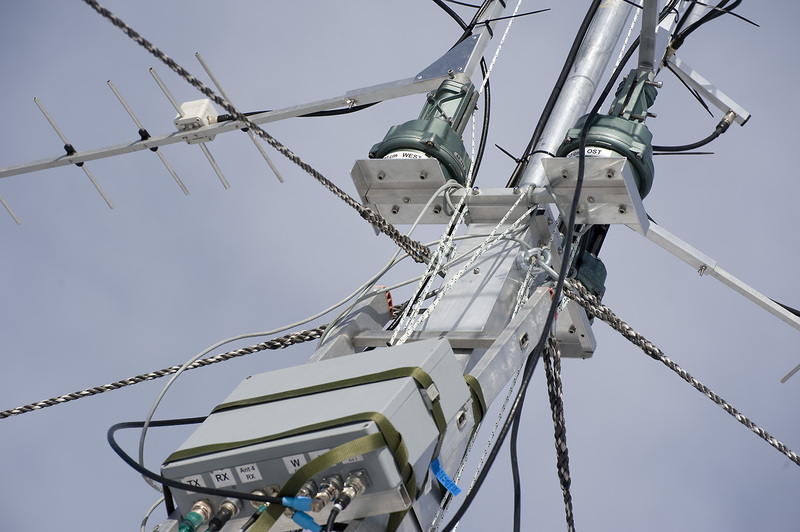 Most antennas were erected until noon, but during cableing everything, setup of antenna directions, IP network, log programs and all the rest the time was running, and we finished just before 14 UTC. Everything was working then! 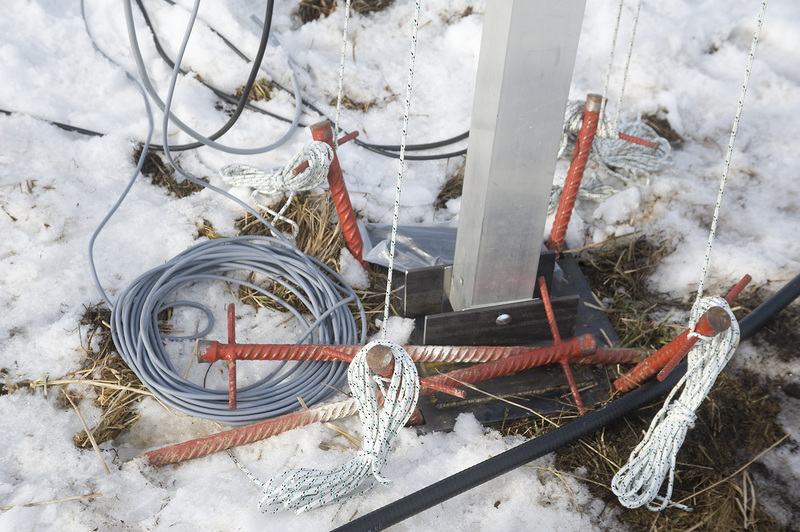 Our special mast contruction with lots of auxiliary ropes for antenna installation has proven effective after we had learned how to handle them, and also the new 8 x MRFE6S9160 PA for 23 cm gave our signal the neccessary punch. We used 3 stacks of 4 x 9 ele for 432 MHz and a single 4 x 23 Ele for 1296 MHz, so everything was smaller than in the DR9A setup. 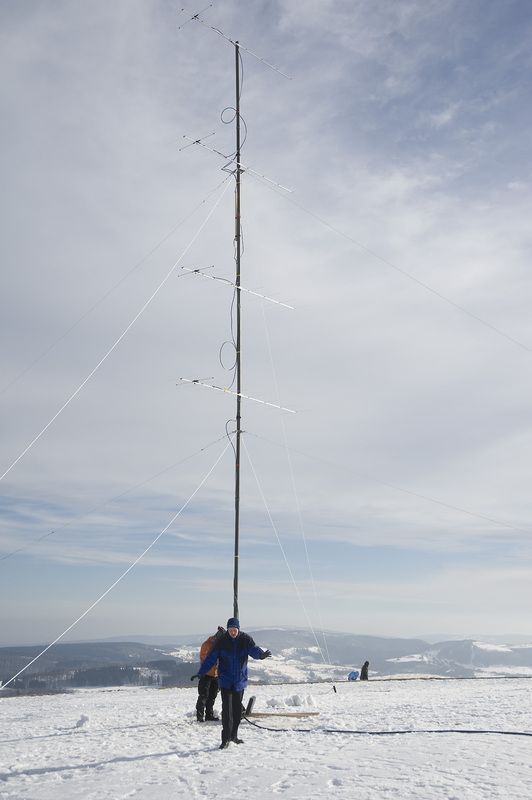 Our friends from DA0FF used 4 separate masts, each fitted with a stack of 4 x 9 ele. And this seemed to be a wise choice. The start was incredible: 142 QSOs in the first hour! - more than in the IARU contest. And it just continued at high levels, hour by hour. There were some condx into France, but no strong ducting, and not with a big influence on the QSO number. 70 cm was less spectacular, nevertheless with more than 80 QSOs in the first hour not bad for an all-band contest, and here also the flow of QSOs continued during the evening. Jens DF5HC was doing a great job at the microphone while Alex DL8AAU started on 23 cm. This band developed into our 'problem child' - around Saturday noon GB3MHZ in JO02 had been heard with S7 tropoducting signal but these condx were gone, and we suffered from excess noise varying with the antenna direction. Suddenly the noise rose to S9 level, and normal operation was not possible anymore. At least the PA worked very well. We checked our equipment, took the masthead preamp out of the signal path and replaced it by another one on the ground, tried an extra bandpass filter in front of everything - nothing helped. So we gave up. - The next day we found out that the source of this noise was DB0TAN, a local digital ATV repeater transmitting DVB-S on 1280 MHz, with 1296 MHz being in the zone of 3rd order transmitter intermodulation. So we could not get rid of it. We tried from time to time when the repeater TX went down, but even then we still had elevated noise levels. Sorry to all stations who copied us and remained unheard! 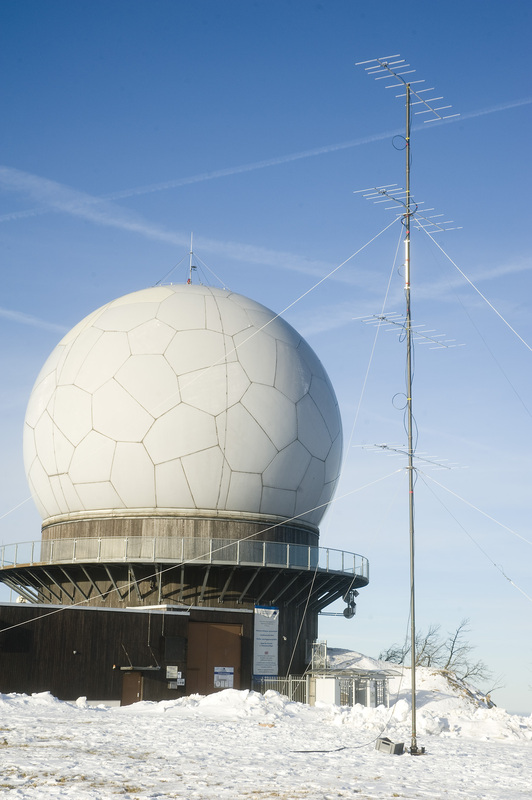 Edit: we found out later that DB0TAN (which is transmitting FM-ATV and not DVB-S) was not the source of our problems, and was switched off for repair at this time. On 70 cm we also had some interference at 80° +/- 30°, from an FM repeater link transmitting with a few W on 70 cm in <50 m from our antenna, but it was not so serious. The weather on Sunday morning was very pleasant, the QSO number on 2 m already >900 (!! ), and 70 cm was going strong too. A great day started. In the afternoon we counted minutes versus QSO numbers. Would the calculation work? - yes, really, around 13:40 UTC the 2 m station gave the number 1200 - unheard on 144 MHz since quite some years. Though the number of valid QSOs is only 1177 because of some dupes, this is still a phenomenal result for a march contest. 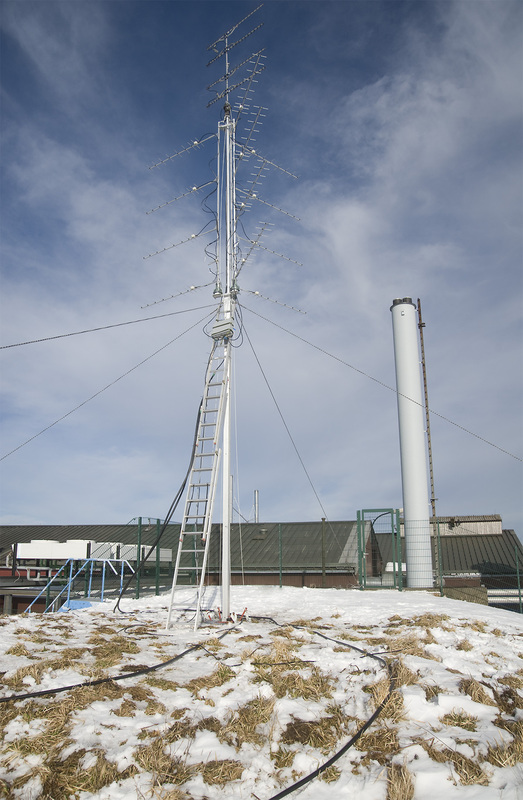 Our 70 cm station was reaching the 450 QSO limit with 139k points - considerably more than any other march result found in the DARC archives since 2001. So we are perfectly happy. Let's hope that the contest god will be kind to us in 2015, after this great start, and that we'll get good results, favourable weather and no equipment failures in the coming contests too. HPE CUAGN from DR9A! After taking down everything, just at sunset.